As well as the two parameters, the currently selected symbol will be loop (infinite loop, continuous sprinkling) and autoplay (the audio will be started as soon as the page is opened as in the AIR / FLASH version). The ability to start and pause / stop selected audio tracks allows you to place “any number” of sounds on a page. Something that is not yet possible in the AIR / Flash version. The output of the sound is always stopped when the page changes. In the AIR / FLASH version no play / pause icon can be displayed yet. The loop parameter is better adjusted with all other sound parameters. these should be set via the associated * sound parameter window *. 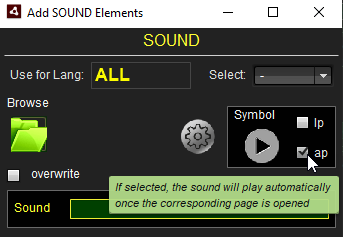 In the Add Sound Element window, the icon is clicked. The desired audio file is selected in the opening Explorer / Finder window and accepted with “Open”.